FIVE hikers – who wish to remain anonymous – were walking along Salt River in The Crags, east of Plett, when stumbling upon five poachers butchering a bush pig. 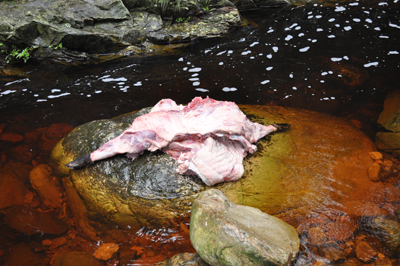 Upon sighting the hikers, the poachers made a hasty escape into the forest towards Kurland Village, leaving a substantial part of the carcass floating in the water. Local police officers were immediately informed but at the time of writing it was unclear whether the poachers had been apprehended. The scene described by the hikers is a gruesome one. “The carcass was in the river and the pig skin was hanging in a tree. The rocks were covered with blood and we found the guts lying in the bush. 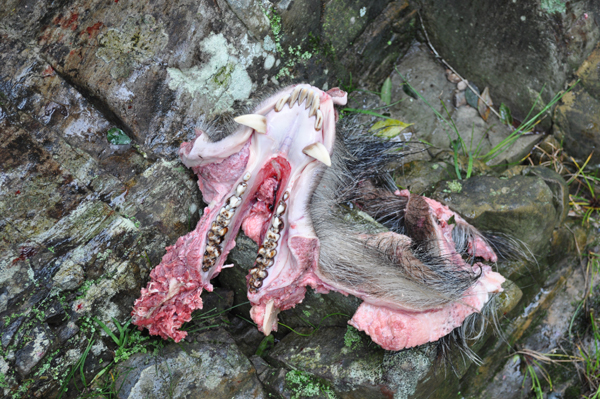 We also found the bush pig’s head floating in a pool nearby – it was really terrible.” They managed to dismantle and partially destroy a trap set up by the poachers. Poaching in The Crags is a common occurrence and with poverty-related social challenges rife in Kurland Village and surrounds, long-term municipal and conservation intervention is needed to curb the on-going poaching of the area’s wildlife. Nature conservation bodies such as the Southern Crags, Redford Road and Natures Valley conservancies are working relentlessly to prevent this practice, e.g. by regular anti-poaching patrols. Nick van Tonder, an intern conservation student based at Ingwe Forest Adventures, is actively involved in conducting snare sweeps in the Southern Crags Conservancy (SCC) area – part of a snare removal programme in The Crags. “Snares have been an on-going problem with not only our wildlife being caught, but also occasionally domestic animals. The proliferation of snaring incidents at identified hot spotspoints to an issue that needs to be addressed urgently. “We seek to break this cycle by processes that involve property snare patrols as well as community-based education,” says Van Tonder. Volunteering is a key component in nature conservation and organisations such as Willing Workers in SA(WWISA), the Orca Foundation and Ingwe Forest Adventures offer nature loving volunteers the opportunity to assist in conserving nature and making a difference. For more info on these volunteer programmes, contact WWISA on 044 534 8958, Orca on 044 533 5083 or Ingwe on 083 442 6115. This entry was posted in News Desk and tagged Ingwe Forest Adventures, Natures Valley Conservancy, Orca Foundation, Plettenburg Bay, Poaching, Redford Conservancy, Salt River, Southern Crags Conservancy, The Crags, Willing Workers in South Africa. Bookmark the permalink.